Wine is here! Check this out. 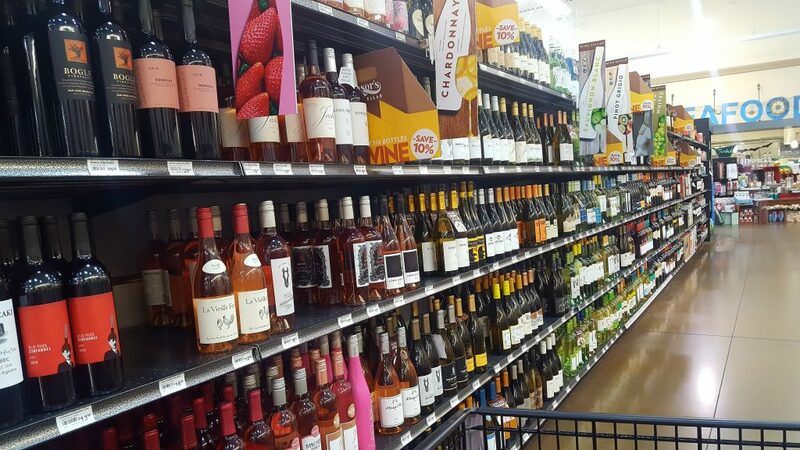 We Okies can now buy wine in the grocery store!!!!! October 1, 2018. Oklahoma and the 21st century. Yep, Oklahoma’s bizarre laws finally addressed this issue and on October 1, 2018, we can now pick up a bottle of Malbec right along with salad ingredients and those steaks that we are planning on grilling. It is amazing! “In My Kitchen” this month finds some grocery store-bought wine, kitchen towels for November 1, Food Huggers, Eataly items, and cookbooks. For the last few years, I have become somewhat obsessed with Día de Muertos. I can probably trace my fascination with this holiday and its traditions back to the very first time I visited New Mexico in October. Of course, sugar skull imagery is culturally hip at the moment so you can find these sort of images everywhere. 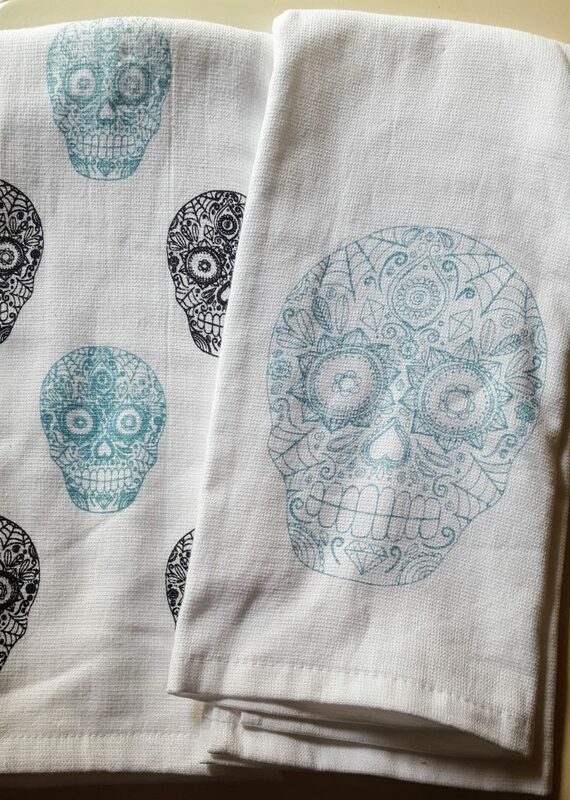 I recently found these kitchen towels at TJ Maxx and had to have them for the upcoming holiday. Forgive me. I’ve come late to the party regarding avocado toasts. Just because I had a lot of sourdough bread on hand recently and just because I had an almost over-the-hill avocado, I made us some toasts for a weekend lunch. I just added salt, pepper and a bit of lemon juice, mashed it up, and topped the toasts with a bit of home grown tomato. Delicious! Where have I been and why did I not make these sooner?!?!?!?! Because I wanted to enjoy this new found love often, I ordered some Food huggers that I had seen in a magazine. Genius! Comes in a set of two for small and giant avocados. We traveled to Boston over the Labor Day weekend. We met my sister, one nephew and one of my sister’s friends there. We had a marvelous time. And, we were staying just steps away from Eataly Boston. The skinny “Eataly” stamped spatula is a jar scraper. I have wanted Bee’s Wrap for some time since I saw some in Canada on another trip. My PB&J wrapped up for lunch on my desk. The measuring spoons are all silicon except for the tablespoon; it’s wooden. I love that design. 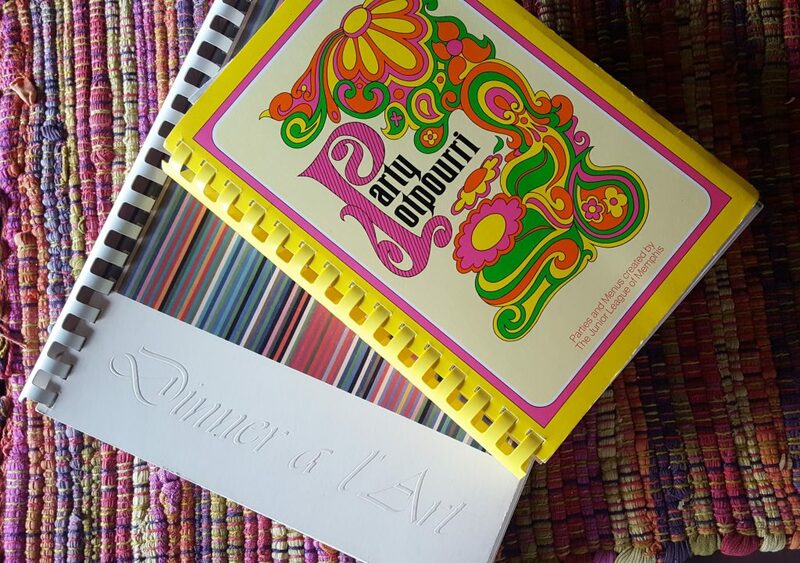 Like I need more cookbooks, but I stumbled into a quaint bookstore recently and found a couple of gems: Party Potpourri a day-glo , Pucci looking cookbook from the Junior League of Memphis (1971) and Dinner a l’ Art, a 1981 cookbook by the The Oklahoma Art Center (the precursor to the Oklahoma City Museum of Art). I am sure there will be some posts to highlight these two retro books at some point here. And, again, like I need more cookbooks…. As I was sitting for a pedicure (probably my last of the sandal-wearing season), I received an email alerting me that I could purchase the Kindle version of My Pantry by Alice Waters for only $2.99. I jumped at it. This is a slim volume (I’m assuming) because I read it and skimmed the recipes in that setting. I will revisit this book again and again if simply for the spice section with recipes for Za’atar, Cumin Salt, Chile-Lime Salt, and Niloufer’s Masala. I can’t wait to try Fanny’s Superfood Granola (included in the whole grain section) which combines buckwheat groats, red quinoa, nuts, sesame seeds, chia seeds, sunflower seeds along with warming spices and honey. I loved that Waters has a 10-liter oak barrel in her kitchen that she makes wine vinegar in. She dumps in all the leftover wine, no matter what color or region. She even dumps in sparkling wine. (For some reason, I had assumed that someone of Waters culinary prowess would have separate vessels for separate wine vinegars, one for champagne vinegar, one for sherry vinegar, etc. Nope, she just dumps it all in!) She also includes directions on making your own apple cider vinegar with peels and apple cores. Other sections in My Pantry include “Nuts,” “Beans and Other Legumes,” “Savory Preserves,” “Preserved Fish and Meats,” “Cheese,” and “Sweet Preserves.” I do have to say that I found some of her preserving instructions a bit suspect. I’m not sure I would actually can anything from this book but I would certainly make some to store in the refrigerator. Because of this short cookbook review, I am also linking up with Foodies Read. 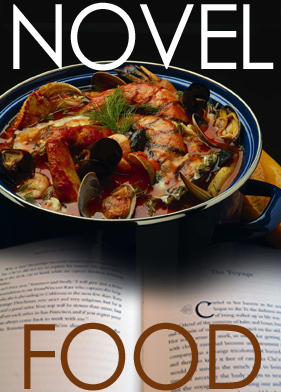 From September 12-October 12, Simona at briciole (a CTB Co-Host) is presenting Novel Food. Link up to this event with all your culinary reads as well. That’s the hodgepodge for this edition of “In My Kitchen” this month. 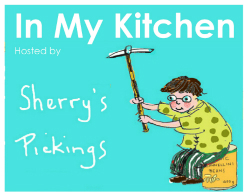 IMK is hosted by Sherry at Sherry’s Pickings. Let me leave you with another nature photo….I recently counted six monarchs on our meager plot of milkweed. The jar scraper has come in handy (for just stirring, too). Wine from the supermarket shelves seems so natural to me that I’m kind of amazed that you didn’t have it before. That 21st amendment really made for a confusing bunch of rules, so every state regulates a different way. Love your tea towels! I love vintage cookbooks. It sound like you found some wonderful ones. I collect Junior League ones which, like Kim says, are the best. These are pretty hilarious though with typical 70s and 80s menus. Wow, you have some nifty new kitchen things—the towels are fabulous, but I really want one of those jar scrapers! Will pick one up next time I’m in Chicago! Haven’t been to the Chicago Eataly. My sister has and says it’s better. We can get wine in grocery stores in Florida too, just as Mae said for Michigan. Oh man, you ought to see the crazy alcohol laws in Pennsylvania where i grew up! Love the kitchen towels and I have a jar scraper. So cool! I love looking through your kitchen. Debra, that was a fascinating article on Oklahoma’s bizarre laws — thanks for the link. As a newcomer to the State (ten years ago) I learned how “restricted” sales were at liquor stores when I wanted to buy a corkscrew to open my just purchased bottle of wine. Nope, no can do. What?! I also had to smile at the reference to “choc” beer — Pete’s Place is just 30 miles south of us with a long and notorious history for their “home brew.” Such an amusing environment we live in. 🙂 Loved your latest cookbook finds, too — in my experience, Junior League tomes (and local compilations) contain “the best of the best.” Recently read Alice Waters’ biography (Coming To My Senses) — again, fascinating — as was your post! Last, but not least, your Monarch photo was GORGEOUS! A few weekends when my hubby & I took our maiden voyage in his “new” boat to the far reaches of Lake Eufaula on our section of the lake, I was amazed at how many Monarchs we encountered flitting across the MILES of water on their annual migration. Love it here! Wow, I guess we weren’t the last ones to legalize supermarket wine. 🙂 Thanks again for hosting, Sherry. I love Eataly! There was talk a while ago that they were going to open in Australia but unfortunately it never eventuated! It looks like Lidia B. has replaced Mario. No trace of him there anymore. It was my first time there. My sister says the one in Chicago is better. 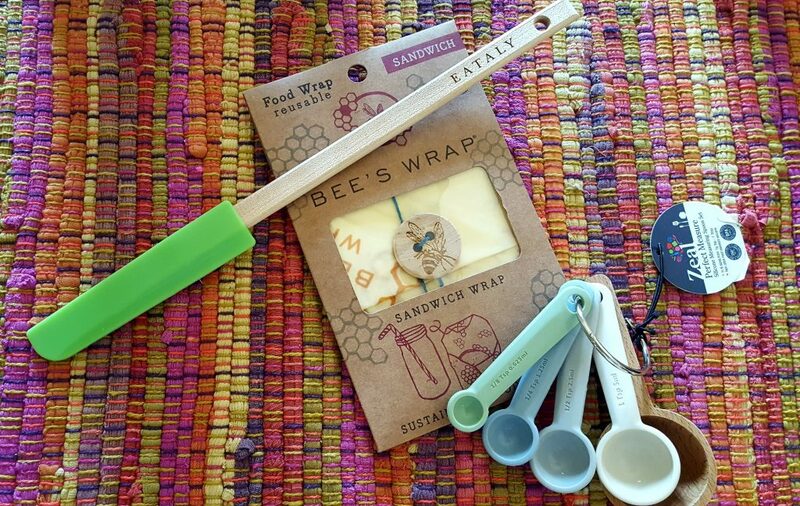 I love the Bees Wrap! I am thinking about finding some more. Trying to re-use instead of just using plastics and throwaways. I can’t wait to post about the retro books. They are hilarious! Thank you for this glimpse into your life. It was a fun little trip for me. I love peeking in everyone’s kitchens, too, Wendy. Especially those international bloggers who mostly make up this group. I learn a lot. I am happy to have discovered your blog here on IMK. 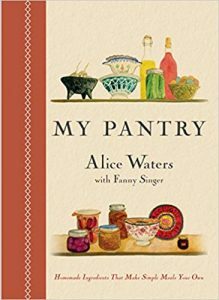 I have that same pantry book by Alice Waters and have found it useful and inspirational. At some point in the book she mentions Marash Turkish Chili which has become a staple in my kitchen, I use it on everything from eggs to vegetables. I planted some milkweed this past spring but it is only about 10 inches high, hopefully we will get some Monarchs next year. 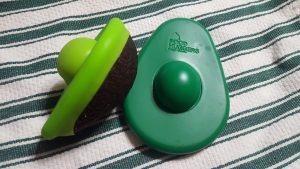 Those food huggers look like a very useful way to conserve the unused portion of an avocado…good for you discovering avocado toast, it is delicious with a poached egg on top as well. Hey, Liz. Glad you stopped by. I will have to try that chili. Sounds delicious. In fact, I will do that now! Will also add a poached egg next time. I’ve never made vinegar — really should give it a try one of these days. I think I’ll start with a liter or two, though, not a 10-liter barrel! And how nice that you can finally buy wine in a grocery store! Terrific stuff in your kitchen this month — thanks. I use a quart jar and use some “mother” from old vinegar. 🙂 I would LOVE a 10-liter barrel though! Lots of good things here and I like the A. Waters cookbook too. Día de Muertos stuff is for sale in most stores here in Chicago area, they have a ton of it and you would love it. We have Eataly here too in Chicago. Glad that you have easy access to wine now, I just assumed it was available in grocery stores in all states. Great fun post, thanks! So many awesome things! I had no idea you could not get wine in the grocery store. In Canada you only get cheap stuff, the good stuff is at the liquor commission. Love all Dia de los muertos stuff too. 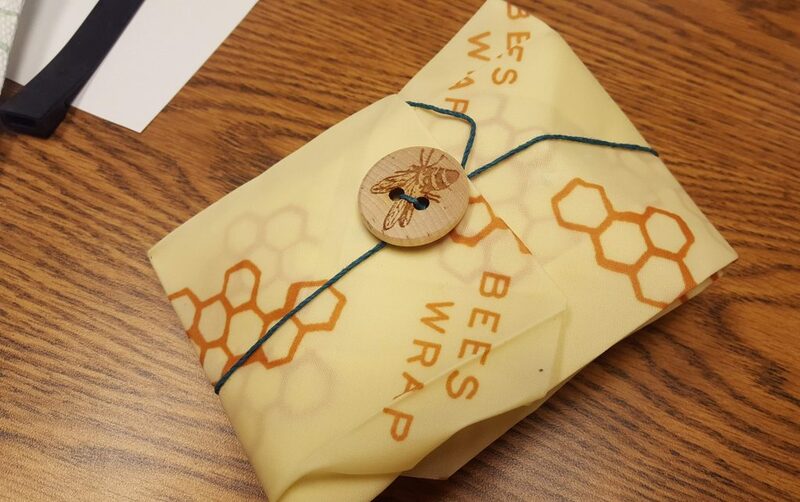 I have heard about Bee’s Wraps, curious to try. The good stuff will still be purchased at our liquor stores. Cheap stuff at grocery stores for now. I love everything in your kitchen. I love the Bee’s Wrap! And I may pick up a copy of Waters’s My Pantry: the whole vinegar thing you describe sounds intriguing. I also need to take a closer look at those Food Huggers. Thank you for your contribution to Novel Food! Thanks for hosting. Looking forward to the next round! So you are a cookbook junkie like I am! I can’t pass the older ones by, especially the community cookbooks. Shame on me to say the collection now surpasses 1000 (Yikes!). After reading Sourdough, and channeling Alice Waters, this new book by her about her Kitchen sounds like one I really should read. Thanks for sharing! I think you have me beat, but I want to do a series of posts on them, especially my Junior League cookbooks. Maybe in 2019. Oooh… I like the sound of that vinegar. Know room for a barrel in my kitchen or laundry but I like the idea or having a go with the apples. Mind you, it’s so warm here the vinegar would ferment in just a few days. We saw the Monarchs in Michoacan. We visited specifically to see the. I’m glad they are being fed in your garden. I would love to pilgrimage to see the Monarchs!